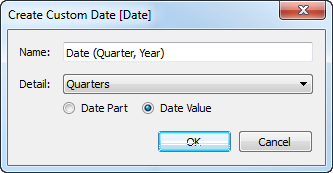 Right-click a date field in the Data window and select Create Custom Date. In the Create Custom Date dialog box, type a name for the custom date. For example, Date (Quarter, Year). Select the level you want to show the date at. Specify whether you want the custom date to be discrete Date Parts or continuous Date Values.